Spotted this on a TTR sales site in China..does any one know if it will fit and is it an easy fit. It says it's a Piagio oil cooler - about 40 pounds... will it fit - any ideas? Thanx Oshanrube any help would be appreciated. Thanx again. thanx Oshanrube. That looks like a staight forward fit think I might order this and give it a go. is it possible to share the site you found the oil cooler on? oil change Raid 4by with oil cooler. Changed oil for first time since buying bike. Out came 2ltrs, manual says 1.2ltrs with filter. Help please also what oil do you recommend (road use only), mineral or sythetic. Was the oil covering the whole of the sight glass before you removed it? My guess is that the previous owner over-filled it. Trust the manual. Make sure that after you have re-filled and run the engine that the oil is about 3/4 up on the sight glass. I use Silkolene Super 4 10/40 semi-synthetic. Thanks Brian Much appreciated. Alan S.
Does anyone know, what is the ID on the oil cooler lines fro the OEM Yamaha oil cooler kit? Sorry - I have looked through my parts catalogues and can't find the oil cooler listed. Hopefully someone else will be able to help you. Would this fit and be alright to use on the ttr? not a bad price and would help. In addition to the banjo bolts you would need to take the clutch cover off and fit a longer blanking bolt to divert the oil around the cooler. The original bolt which needs replacing is part 19 here. 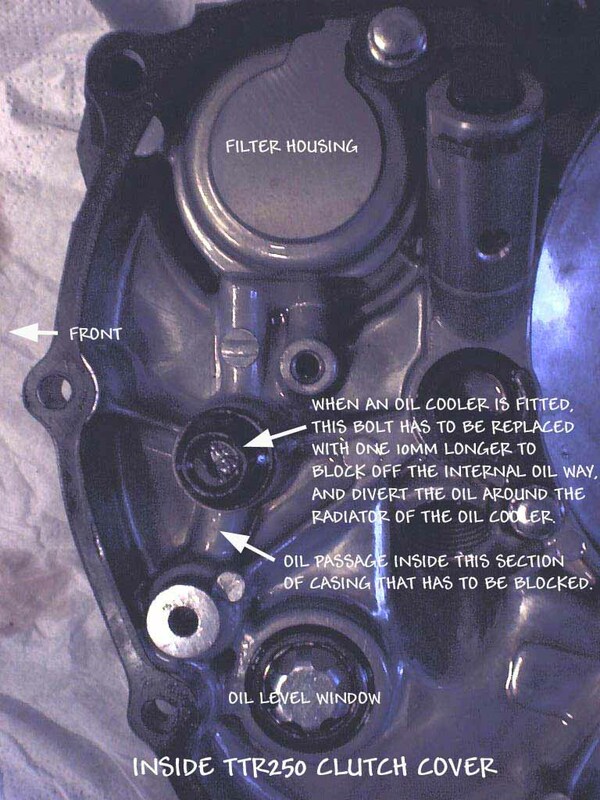 Banjo bolt information in the pic as requested plus details of the blanking plug you will need to route the oil around the cooler. I was tidying up the bench (what a mess ) and found a container with these in. Just got to find the oil cooler to go with 'em now! Raid with oil cooler, how much oil? I don't know, but.......... it'll be less than a pint, won't it? If 'twere mine I'd fill to the line on the sight glass and warm the engine up. When it's warm the cooler should be as full as it will be and I'd top the level up to the line on the sight glass again. If you live near Sydney in Australia you can get a complete kit from Yamaha Australia via your bike shop. Part number YAM-4GY-WO793-00 - cost $285 Australian at the beginning of 2002. Adam lives in Windsor NSW and got his from Wombat Motorcycles (45878153). Speak to Gary or Angie or Jay (the new owner) and they can order you one. Costs about $250. The kit comes with everything you need and takes about an hour to install. The hardest part is removing the clutch cover to replace an existing blanking bolt with a 10mm longer one to blank off the internal oilway and divert the oil around radiator part of the cooler - see photograph. The kit even comes with a new clutch cover gasket. You get about 1/2 litre more oil capacity and prolongs the life of the oil dramatically. Anybody with basic tools and mechanical knowledge can do it. Adam says "Feel free to email me at adkaz71@hotmail.com with any questions". For UK owners, the part is available from Yamaha Holland via your local Yamaha Dealer - retail price is £226.63 GBP. Some good advice is to fit a bash plate to protect the oil lines which run from the crankcase to the radiator. Favourite quote: To be old & wise first you must be young & dumb! Thanks guys....1.5 litres sounds good to me, ill give it a go. Thanks again. Not sure if it's nessasary to fit one????? any thoughts??? Depends on your riding conditions I guess. If you are going to be constantly thrashing the engine, or ride in Sahara-type conditions, then the extra cooling and oil capacity will certainly help extend the oil and engine life. I have got an original Yam cooler ready to fit to my 325 when I get around to fitting the new barrel. I recall another forum member researching an after-market cooler to fit the TTR - did he succeed? Has anyone found a good after-market oil cooler solution they can recommend to other owners please? Some of the leads in this thread looked promising. I get asked occasionally and would like to have an aswer if possible. Bump - any up to date information on after-market oil coolers please guys? "Tried Garry at Wombat and the Yamaha people here to get an oil cooler for the new TTR, some of them even investigated the part number I got from the TTR250 FAQ. It seems the last one sold here in OZ was in 2003 ." I have contacted Fowlers to see if they are able to source an original cooler from Yamaha Holland but it seems as though I am going to have to change the FAQ entry to say that the oil cooler kit is no longer available. Any recent information on oil collers will be really appreciated! So the only way forward for an owner wanting to fit an oil cooler would be to buy a s/h unit or to adapt one from another bike. I have the unit recently removed from an OE version, the only item i do not have is the longer bolt as described in the picture. It is for sale at £150 excluding postage. Wow - that's a rarity - haven't seen one put up for sale for ages. I recommend that anyone interested moves very quickly! Anyone know of a source of M12x1.0 bolts in the UK please? Have you tried the rope and wire place in Bakers Yard Marsh Barton they do a whole range of ss nuts and bolts of nearly every size...... Ive used them many times. Ok things not going to plan finding this bolt. Is this a stupid idea. Brass rod of correct size, buy tapp & dies set off ebay and make a plug with a straight cut for a screw driver to screw it in as its only to divert the oil ?? Does anyone have the long bolt I'll need to divert the oil flow to the radiator? Allweatherbiker have you got the bolt I would need? Have I missed it in your packaging? If allweatherbiker runs the TTR with the oil cooler removed and the blanking bolt still fitted it will seize the engine (been there and got the T shirt ) so best replace it with the shorter bolt to allow the oil to circulate asap! LOL noeyedear I don't have a long bolt either....so I have been running a oil cooler with no oil in it, yet it dripped out oil when removed...well happy days for me as the engine won't seize :).....Maybe if ya need a longer bolt, you would have to get a engineering firm to make one or weld a bit extra on the short bolt. Glad to hear Allweatherbiker's engine won't seize. Not so good for me that neither he nor Noeyedear have the crucial long bolt. From what I've understood on this thread the bolt is not commercially available, bugger. Does anyone have the bolt I need or know where I can get a bolt from please? this may be a daft question I hope not .My ttr is fitted with an oil cooler which takes the oil capacity slightly higher than without I beleive so my question is when the bike is refilled with fresh oil should the oil sit in the sight glass at the 3/4 mark or slightly above to accomodate the cooler and how much in total would you recomend ? I don't think it matters if a oil cooler is installed or not when it comes to the oil level in the site glass. Fill between upper and lower line. NOT TOO Much. Someone may come later and correct me, but it don't matter if it has a cooler or not oil levels in motor stay the same. You Might have to use a tad more oil - OR Not. -When I put a Oil cooler on my Harley, I figured it would take a bit more oil since there was some extra oil line added to and from the actual cooler and then to consider the volume of oil in the cooler, but as it turns out it was not enough to worry about. I got an oil cooler on my 325. When I change the oil, I fill up to the top line, run the engine to make sure the cooler and oil lines are full, let it sit for a while and then top back up to the top mark. When I had an oil cooler fitted to mine, the instructions said to add 200ml extra oil. Total fill after drain with filter being 1.3L. I have run 1.3L without the cooler for years with no ill effect. Oil level is better over than under as TTR crankcase temps in hot weather are very, very high. Bike has now got > 70,000 km without even new rings yet. When I had an oil cooler fitted to mine, the instructions said to add 200ml extra oil. Total fill after drain with filter being 1.3L. I have run 1.3L without the cooler for years with no ill effect. 1.3 liters is the standard oil change with filter for a blue model. The total amount is 1.4L. About 1.5 would be good with an oil cooler. According to my Yamaha workshop manual 1.1L periodic change, 1.2L with filter, 1.45L in total. Without oil cooler, of course. It's a 100cc less for 6-plate clutch engine as the cover is shallower i.e. 1,000cc for an oil change only. The standard engine displacement is 249cc. Cc's (cubic centimeters) does not relate to oil volume. It is to do with the stroke/bore/displacement. That's not how the thread reads, Jarrah. You responded to chrisstdt, incorrectly. The volume (capacity) of the engine's swept volume was never in doubt. Only the volume of oil in the engine was being queried.